What if Facebook took over the world -- even more than it already has? What if the almighty social networking site existed in the age of M.C. Escher or Salvador Dali, and served as their inspirations? What if that damn website was watching you watching it watch you? For an eerily beautiful answer to all of the questions above, we highly recommend checking the dark illustrations of Pawel Kuczynski. The artist, born in Szczecin, Poland, creates surreal satires that, gorgeous as they may be, strike a little too close to home for our liking. His illustration series features the iconic Facebook logo in all its creepy glory, serving as surveillance camera, weapon, submarine and body of water. The images juxtapose a dystopian future with almost childlike illustrations, yielding seriously foreboding effects. The depictions, of course, comment on our society's growing obsession with Mark Zuckerberg's brainchild, which has now become a crucial aspect of so many of our lives. 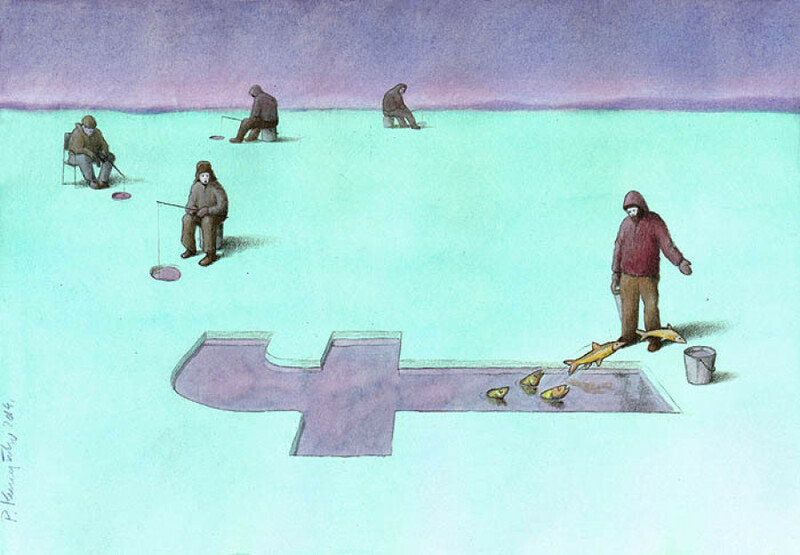 From our daily tasks to our identities to our quests for love and knowledge, there are few spaces safe from that little blue "f."
"Some people say, that my works are surrealist drawings," Kuczynski explained in an email to The Huffington Post. "But I think, that I'm a realistic illustrator of our times... our surreal times." Think about that next time you update your status.